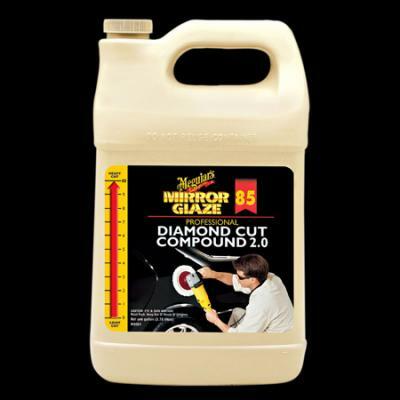 Diamond Cut Compound rates at 10 on Meguiars' aggresion scale of 0-10. Compounds come in two flavors ... lighter and heavier ... but either is the most aggresive cleaner appropriate for automotive paint under the right conditions. Dr. Detail recommends this level of cleaner for paints that have virtually no gloss left, or 1000 grit color sanding marks. This materials should be used with a wool pad and followed with the matched Cleaner Glaze, M82, Swirl Free Polish, for a flawless finish. For fresh paint be sure to wait 45 to 60 days before waxing. Always check with your paint supplier for the best minimum time to let it dry out before applying the protective coat. Glazes are always OK.